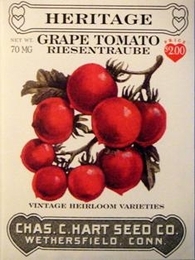 The name means "giant bunch of grapes" this is the original grape tomato grown by Pennsylvania Dutch around 1856. Often grown to make wine, even when fresh these small fruits have BIG tomato taste. Compact indeterminate plants bear large clusters of 20 or more fruits the size of a large cherry, with a distinct point at the blossom end. Plant seed indoors 6-8 weeks before danger of frost is past. May also be planted outdoors after danger of frost is past. Plants seed 1 inch apart and cover with 1/4 inch of fines soil, well pressed down. Place seed starting tray in very warm place (both day and night) and cover with plastic to preserve moisture until seeds sprout. Germinates in 7-14 days depending on temperature. Matures in 60 days from setting out. Bulk Heirloom Tomato seed available. 2lbs of Heirloom Tomato seed needed per acre. 4oz needed per acre if using transplants. Average Heirloom Tomato yield per acre - 741 bushels. On average, 1oz of seed can produce 3000 Heirloom Tomato plants.